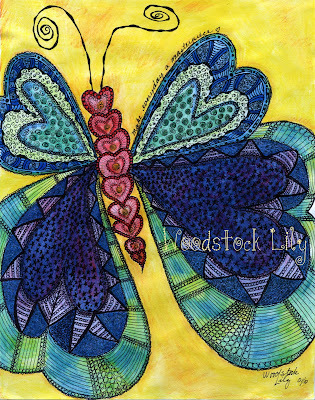 ~Woodstock Lily~: Are You a Worry Wart? I'm guilty of this and have attracted answered worries just as I visualized the event or circumstances in my head happening. I spent last night worrying about things that have not happened, and probably never will happen, unless they turn into answered worries..... errr I mean prayers. My family used to call people that worried a lot "Worry Warts". Here's how I can change it. Seeing it, recognizing it, and noticing I'm doing it is half the battle. YAY! I'm halfway there already in one thought! Changing my thoughts, changes my outcome. Visualize what I DO want to happen. Spend my time seeing the outcome in a positive light rather than a negative one. Instead of seeing myself freaked out about a situation, see myself at ease, going with the flow, laughing, eyes sparkling, radiating love and being the person I know I am spiritually. Get up and do something else. I wasn't sleeping anyway, why waste the time awake doing something negative. Take deep cleansing breaths. Each time I exhale, I release the worry and the negative thoughts. Count. Yes, even counting can work to bypass the negative thought patterns worry causes. Put the worry in a pink bubble and watch it float away. My BFF, Dylan, taught me this one. I can also visualize myself in the pink bubble and watch my negative thoughts bounce off the pink bubble and shatter into a zillion pieces. I'm ready to be whole, healed and worry wart free in my life. I'm serious about changing my life, my thoughts, my outcomes, my sentences, my moments into living in the NOW. How about you? Pinky promise with me that we can do this together! Come on... gimme that little finger. There! Don't you feel better already? I live with three of the best when it comes to worry warts! Sometimes I get a giggle out of the things they find to worry about. I've been called Pollyanna... I guess that's a good thing. You're on the right track. Just CHOOSE to be positive. You can do it, Sis! I cheated on my fears, broke up with my doubts, got engaged to my faith, and soon I will be happily married to my Dreams! May God bless all your hopes and dreams as he has done mine. The journey begins with you. It drives me round the bend, especially since I live with a man who worries about absolutely nothing. At all. Ever. Thank you for visiting... I'm glad you are paper/ribbon/journal junkie, and I'm particularly glad you are happy with that!!! Ack! I am a huge worrywart. I have been my whole entire life - I remember being afraid my mom was killed in a car wreck when I was FIVE because she was a couple minutes late. I think my brain is wired crazy. So lovely to hear from you and visit your beautiful blog. I know just what you mean about worrying. We can drive our selves batty with it. I like what bashar says on youtube. "Face the worry and see what beliefs you hold to why you fear this and change your beliefs". I think it is the similar as what you've written. Hope you have an amazing day with no worries! I understand the compulsion to worry! It's something I have to be intentional about and have a daily meditation practice to help me with. Great blog - very inspiring. Thanks for stopping by and deciding to follow my blog, it brought me here to your colorful world! I think you can be a pollyanna and a worry wart at the same time. I'm not sure how that works but I feel like I'm both... the glass is more than half full but I worry about sooooo many things. Thanks for the good advice...oh, I love the butterfly illustration by the way! beautiful! I got caught up on several of your posts, and then noticed the "George Clooney of the Dog World," and wondered if he doesn't look more like George Goebbels--who was also pretty cute, but maybe not in the same way. Yup, I'm an anxious soul too, but realise just how much it has held me back from truly following my heart and soul. I just love your strategies - inspired and soooo helpful. Thank you. P.S. My new blog 'home' is now here; http://www.tanglefrost.wordpress.com. Would love you to visit! Such much to learn, and so many wonderful people to learn from! I'm a worrywart from way back, but I am trying to clean up my act :) Pinky swear! Visiting via the Goddess. Great post! Nor all thy tears wash out a line of it." Yes, great post. I know the first thing I do when I catch myself worrying is be thankful that I caught myself doing it, so that I can change my attention!